Quonset Point????? The world-famous? ?GEICO Skytypers??? ?Air Show Team will perform during? ?House Air Showoning the? ?Rhode Island National Guard on? ?June 9-10, 2018.??? ?The team?? 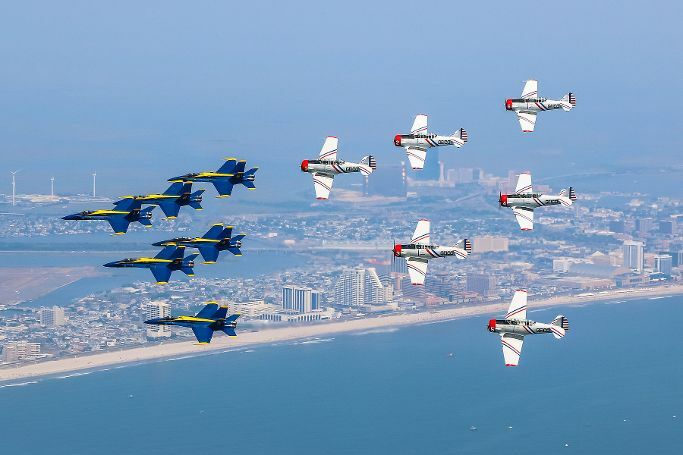 ?s six vintage SNJ training aircraft will roar over air show crowds in a low-level, precision- formation flying demonstration honoring service members of the ?? ?Greatest Generation.?????? ?The air show routine includes more than 20 combat tactics and maneuvers that helped control the skies during World War II and the Korean Conflict. ?? ?Most of our team members earned their wings in the military and we always pay tribute to the brave combat pilots who originally trained in our aircraft as well as those currently serving in the Armed Forces,??? says GEICO Skytypers Commanding Officer? ?Larry Arken.? ?Arken also is the team?? ?s flight leader.?? ?It is a special privilege to fly these vintage WWII trainers on behalf of GEICO.??? The GEICO Skytypers are based in Farmingdale, NY, where the 75-year-old planes are maintained by a full-time staff of expert mechanics who travel with the pilots to every air show. In addition to their air show performances, the SNJs are retrofitted to type giant messages in the sky. Flying wingtip-to-wingtip in a line-abreast formation, the lead plane sends computer signals to each of four other aircraft, synchronizing smoke releases to generate 1,000-foot-tall messages. Each letter is higher than the Empire State Building and can be formed in three to four seconds.?? ?? ?People on the ground can see our messages from 15 miles away,??? saysSteve Kapur, the GEICO Skytypers marketing officer. ?? ?The messages appear in dot-matrix style, but on a monumental scale and 17 times faster than traditional skywriting.??? Gates open at 9:00 a.m. with flying demonstrations will begin at 11:00 a.m on Saturday and Sunday.????The??U.S. Navy Blue Angels? ?will headline the air show that includes world-class military and civilian acts such as:??U.S. Air Force F-35 Heritage Flight Team, P-51D Mustang, Shockwave Jet Truck and aerobatic pilots? ?Michael Goulian??and? ?Sean D. Tucker, and more!?? For more information on the GEICO Skytypers, visit?? For tickets, parking, directions, and additional information for the 2018 Rhode Island National Guard Open House Air Show, visit??https://www.rhodeislandairshow.com? ?